Jeremy Laidler has hung up his boots after 87 games across three clubs. Journeyman Jeremy Laidler has called an end to his AFL career after 10 years and 87 games at three clubs. Drafted by Geelong with pick #32 in the 2008 Rookie Draft, Laidler played two games with the Cats before being traded to Carlton in 2010 and then making his way to Sydney in 2013 as a delisted free agent. 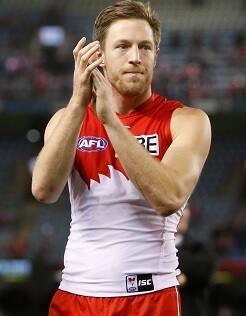 Laidler retires after 87 AFL games, including 61 in red and white. The 28-year-old will remain at the Club, taking up a position as a development coach. Laidler says the timing is right to transition to the next stage of his career. “Coming into the AFL system I wasn’t sure if my career would last two years – so I feel really fortunate to have played for 10. Although it was a rollercoaster along the way I have thoroughly enjoyed my time at all three clubs,” Laidler said. Sydney Swans Head of Football Tom Harley says Laidler has all the right attributes to make a smooth transition into coaching. “I would like to welcome Jeremy to our coaching ranks,” Harley said.